All lanes of U.S. Highway 101 between Redwood City and San Carlos shut down for more than an hour Thursday after an RV caught on fire, causing a major traffic snarl on one of the busiest freeways in the Bay Area. CHP officials said the occupants of the RV were carrying rockets back from a rocket hobby show when one apparently exploded, sparking the fire. "It couldn't have happened at a worse time," CHP Officer Art Montiel said. "It's commute hour, everybody's trying to get home and then this happens." 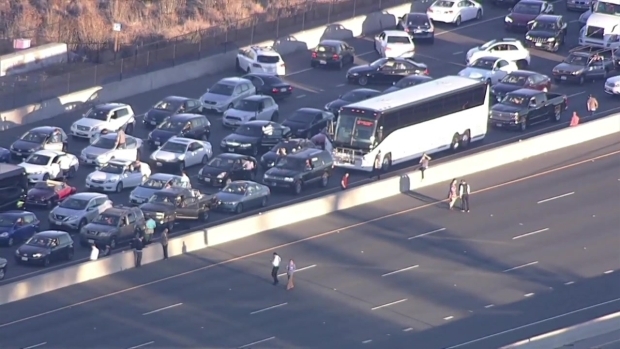 People take selfies, hold hands as U.S. Hwy 101 comes to a standstill due to RV fire. The Sheriff's Office evacuated homes and businesses in the immediate area as a precaution after firefighters reported hazardous materials in the RV. A big concern for responders was a 100-gallon propane tank about half full in the RV. Firefighters kep a steady stream of water on the tank until it was deemed safe. "Unfortunately we had to shut down all lanes for the safety of the public," Montiel said. "We didn't know what we had. We heard there were explosions in the vehicle, so we had to make sure everyone was safe." Two people and two dogs inside the RV all made it out safely, police said. 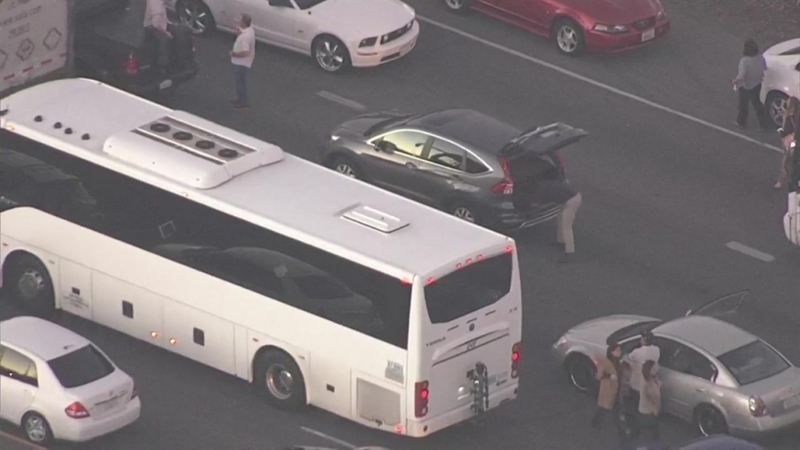 The NBC Bay Area chopper showed commuters waiting on the highway during rush hour, as traffic backed up for miles. Some were seen getting out of their cars, climbing the divider and taking selfies on the freeway. A few held hands and danced. A person was also seen practicing basketball moves and dribbling on the highway while waiting for lanes to reopen. Chloe Park was on a tech shuttle on Highway 101, and tweeted: "An RV is on fire and the 101 is a parking lot. Meanwhile, everyone on the FB bus are furiously Googling alt routes." Earlier on Thursday, the San Francisco Hall of Justice went under lockdown, after police began investigating a bomb threat at a tow lot on 7th and Bryant streets which closed down Interstate 80 and U.S. Highway 101 for nearly three hours, causing a traffic nightmare for afternoon commuters.